How can I keep Tibby interested in working with me? After one click/treat she will walk away. I took a private lesson this week and our instructor said when that happens I should turn my back and wait for her to find me and make eye contact. I know Tibby is hungry, because she only eats what I hand feed her (doing tricks, recalls and excersises). It doesn’t seem to matter if she hasn’t eaten all day long and we are working in the boringest place (bathroom) she will look at the wall or sniff the floor and ignore me. She’s 11 months old, so she should have some attention span. Often, the problem is people try too hard to get the dog’s attention. They will bring the best treats, make funny noises, trying really hard to keep the dog’s attention. I think many dogs will understand that as a pressure, as a request to work with you. To this request, they can say yes or no, depending on how good treats one has, how hard one tries and how they feel at that moment. That’s why I prefer to not even ask questions. I will wait for the puppy to come to me herself, asking for attention. If I feel like saying yes, I will do a little something with her. If her focus waders off, that’s perfectly o.k., no hard feelings, no pressure, but the option to interact with me and earn treats is over, sorry, but I have other things to do as wait for the dog to notice I exist. -- About what your instructor said, only that I usually give them even longer break (impossible in normal class situation, but definitely possible in our class! ), if just coming to you for eye contact is enough, then she can still choose to first check out something and then come back to work some more. As I always say: don’t ask the dog to work with you. Let the dog ask to work with you. Don’t push for more. Let the dog push for more. Good advice Thank you. I think I will give her a day off and see how it goes on Monday. We have been working pretty hard for the last week with this class and other training things too. To feed her dinner I did a few simple recall games that she loves and her attitude was happy, happy. I think she just needs a break from learning new things. Yes, trying to get too much in too little time often backfires. It’s really important to not push them for more&more and give them time and an opportunity that THEY push you. You taught her A LOT in last week, it could be she felt some pressure… Give her time, teaching that or another trick is never as important as enjoying the process and creating a great relationship, that what it’s all about in the first place. Well, we went all day without training. Tonight Tibby started jumping in and out of her box, so I guess she was bored! Suggestion: Put the food in your hands, or at least in a container that you don’t have to look away from Tibby. You disconnect to get the cookies. Also, you need to give the reward quicker. There is alot of lag between the offering, click and treat. The cat is awesome! Good point! It’s important to be quick, especially if you are trying to get more action from the dog. Oh, you don’t need to be THAT calm and serious! 🙂 I mean, try to not be pushy in order to get her attention, wait for her to offer the attention herself. Once she does, you can be more fun, especially for big steps forward, like for 4in! Reward that by also marking it with a voice, maybe getting up and do some playing or something. But yes, she is definitely offering things on her own now, very good! 1. Synchro seems to balance on the edge of the dish instead of get all the way into it, any suggestions how I can get all four feet in? 2. For frog position, should I be trying to get more duration? If so, how do I build up duration, he’s so wiggly! Any other comments are certainly welcome, thanks! Ok. I love the cat walking by! I’m not sure, but it looks like he stands on the edge so he can be closer to you while still meeting criteria. I bet if you just keep shaping, he’ll be all the way in very soon. Yes, as also Lotta noticed, “trying to stay close to that hand” is a very common problem, especially when you are always rewarding from the hand. That’s why I like tossing treats, it’s easier for them to forget that hand and focus on their job instead. Hi Silvia, sorry, I’m a beginner in those tricks :'( and I don’t understand something about the rewards… Can you please explain. You say that sometimes you reward by hand and sometime you toss the food on the floor. 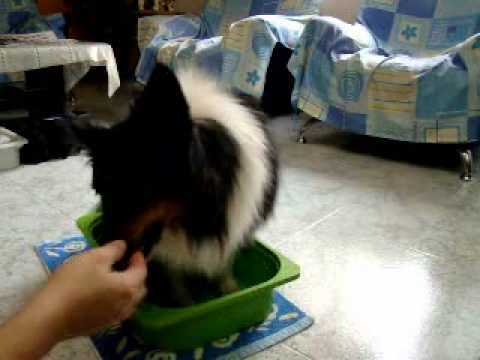 For example on the exercice of 4 paws in a box, if you throw the food, do you throw it away so the dog sort of “starts” again everytime, or do you throw it IN the box, to continue the progression (just like if you’re feeding from the hand) ? Sure, those are very good questions! For 4in, I will at the beginning be tossing food away, so that they can start again. Once they offer 4in, I will reward a couple of times from my hand for staying in the box, then say “go” and throw a treat away to try again. The same for a plate trick: at the beginning mostly throwing, then rewarding on for some duration with a throw to end a behaviour. If the puppy prefers toys over food, I will reward by a toy every two or three clicks at the beginning to make them happier about the food as a consequence. But yes, a toy breaks the flow of thinking a little and can’t be given as fast as a treat, so I then only give toy every 4-5-6 etc. clicks and eventually, only use it for a jackpot when shaping a new behaviour. Once the dog understands the behaviour to some degree and doesn’t need that many informations on in which direction to think (as they know it already), then I switch to toys, it gives you faster, nicer performance. But yes, for new and thinking things, food is easier, but toys are still great for jackpots or a break between one and another trick. Oh, your frog is wonderful! Cool what a cute, active puppy! I can see why they breed them for agility! For 4in, go back to the last box he was in with 4 feet and then for your next one, try to find one that doesn’t have such tempting edges as the one in the video 🙂 and then of course, don’t click for feet on the edges if he is still trying it. With frog, you are doing great already, you are actually getting some duration already! Just keep adding it like that, clicking for keeping the legs out and maybe not necessarily for the action as such anymore once it’s very clear to him (meaning that when he is pushing hind feet out nicely every time, don’t click the push anymore, wait a tiny little bit and click for keeping them that way). I know there are different theories on it, but for ignoring the food on the floor, I actually reward by that same food from the floor. The reasoning is that it’s more similar to eventual start line stay: it’s very easy to have a perfect stay if the dog never gets to do that jump right in front of him, if you always go back and then start somewhere else, somehow differently, as they learn that jump will never be their and just forget about it 🙂 But in real life, the only reward the dog gets for a stay is that jump that is right in front of him the whole stay. So the puppy needs to learn that even if your reward is right there, waiting for you, and you are definitely getting it, you can only take it when told so. Silvia--I like your theory on rewarding with the same food/toy they have ignored. It is really working for Elsa. I had previously rewarded with food for ignoring a toy (she’s crazy for toys), but once I switched to rewarding her with the same toy I have seen an amazing improvement with her focus on work even with the toy right in front of her. THANK YOU! Thanks I will switch that! Sure, it was good to start that way. To challenge him some more, teach him that even though he can get it, he can only get it when you say so -- wait until he does something, click and tell him to get it. For your edge problem, how about using a silcone pan instead of glass. Then the sides will collapse. I thought I’d share something about the training. I know recalls are crucial and have slacked off on training them because Da Vinci does a great job with ME. However, he has been choosing not to come to my husband when called…which isn’t acceptable and frustrates my husband. I am the primary trainer and the one who does agility with our dogs, so I try to minimize stress for my husband by working with the dogs a lot. In this case, I think Da Vinci just didn’t seem to find recalls with Josh nearly as exciting (usually having to come inside). So, I tacked the recall portion of this lesson a little differently. I am of course working on recalls with him, but I bought some enticing treats and really fun new toys (rabbit fur, crunch-n-tugs, fun stuff with fringe and squeakers) for the sole purpose of handing one to Josh and asking him to call Da Vinci to play (spring break here so perfect timing as we are both home). I watch and coach him to play with Da Vinci and then tell him when to end the game and put the toy away. If play isn’t an option, he has a new yummy treat to offer the pup. So far so good! I’m open to any suggestions :)! I thought this would be a fun and useful way to introduce new toys I eventually plan to use in training…right now they are new exciting things “Dad” has to offer. I watched a bunch of free Susan Garrett webinars on recall. I’m not sure if they are still free but I have copies! She mentions the use of restrained recalls to build value for yourself.. There is a step-by-step. I’ve done one session with Summer so far and there is a difference! I think u’re doing great by getting your husband to build value for himself in the dogs eyes.. If he is willing you will both do great! Maybe Silvia has her own tricks to share? My main trick is to do lots of tricks with the puppy to build great working relationships that will, as a consequence, give you a great recall. As Kristin noticed, she already has that with Da Vinci, so he comes for her, but not so much for her husband who doesn’t normally work with him. The more he will play with the dog and maybe do a trick or two with him when he has time, the more Da Vinci will listen to him too. Sure, you are on a right way, having your husband do the #1 of the homework! 🙂 It’s true that most herding breeds will recall nicely to their handler, hoping to get something to work 🙂 When somebody who normally doesn’t work with them calls them, it’s harder, so it’s good to give your husband the extra cool toys and treats to reward his effort. Kristin, My husband does not have much interest in actual training, but he does play with the dogs ALOT! He also gives them “free” food while he eats (his choice and apparently he doesn’t mind being surrounded by dogs during every meal). This seems to be enough to create value for being with him and so they will *usually* run to him when he calls them. It’s good enough for him. Husbands are extremely hard to train! After watching everyone’s awesome videos I finally put together my own. I needed help videoing and also putting it together for youtube so its taken a while.. Box exercise so far so good! Froggy legs were very hard.. She does not do it naturally even when she was a puppy. Also, because of her hip dysplasia I was worried the position might hurt her.. This is the first time using the cushion and it is going MUCH better! We had her hip check up and the vet says now her left hip is completely out of the socket, the right one is a little bit in. But she is not in pain, so no surgery yet! Excellent! I may have missed something…are we to reward for one paw and two paw touches? Are we supposed to reward whichever they do or start putting each on cue? Summer was very insistent on doing just two paws, and then when i got a new object she offered just one. Finally we got a variety! Just click for all and any I think.. Yes, we’ll actually need both, one paw touches and both feet touches. At the beginning, I click everything, then I name it, I have “tap” for one and “both” for both. Ok. Should we start naming it now? Wow! I just tried adding a cue with all three dogs. They did wonderful! They all wanted to put both paws on which worked great for pairing up “both” with the offered behavior and the click&treat. To get one paw, I propped the plate/ pad up on my foot or leg to encourage them to offer a single paw…clicking and pairing “tap” as they did. In one session, I was able to then place it back on the floor and get a couple of each “tap” and ‘both” on cue. Hopefully it really sinks in between now and our next session. Tried to video, but apparently I didn’t push the button hard enough. Sorry. Well, we have a MINIMAL progress on a frog excercise. I couldn´t tempt him to crawl, he got up to get the treat. Then we tried it over several pillows, different shapes and sizes -- still no luck, he just stands up. My last resort was trying to lure him into crawling under something. So I sat on the floor with my legs stretched and slightly bent at the knees and strated luring him under my knees. This finally worked! I got some hind leg stretching. Here are my first video and questions. 1. I’m pretty pleased with the recall. When Keen was very young it was perfect! Then we had a period that Keen discovered there are other interesting things in the world, like other dogs. I think I pretty much convinced her I’m interesting too by running, moving a lot, being playful when she chooses for me, use some food. 3. I did not do anything special for this because I thought that’s ok already. Can you comment if it is good enough? Like I said, she starts looking at the food when I take it in my hand. 4. She already knew how to stand on the box. Is it important to teach her to stand in the box? Same problem here, adding duration. Maybe standing in the box will make that easier? 5. I managed to click the ‘frog’ position a few times, at the dog club.I could not film it yet. She does it when she is on the lead and she wants to go to something (like a playing dog). I clicked it but most of the time I forgot to name it! At home she does not do it. I’ll spend some time today to check how my classmates are managing this. Anyway, we are having fun! 3. As you noticed already: if she is too focused on treats in your hand, then this part is not good enough yet. She is fine with food in the bowl as she is used to that, now just make her used to food in the hand too, the same way you did with a bowl! 4. Depends on how you define important 🙂 The trick is by it’s definition not very important 🙂 But yet, I definitely believe teaching tricks is important, otherwise I wouldn’t be having this class. And I guess you agree with me on that, otherwise you wouldn’t be taking this class 🙂 So yes, I think you want to teach 4in too, not because it has any extra importance, but because teaching tricks is fun 🙂 Very good that you also trained 4on, great idea for everybody finished with first assignment already!!! 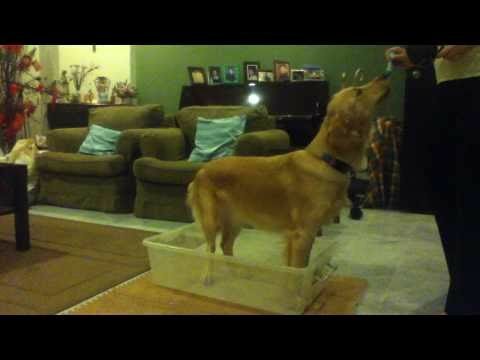 Your pup has some nice balance work for Keen to get all her paw on a small surface area. I noticed with my pup he tires quickly when trying extreme balance work. For example, 2 paw or all paws on balance disc. Thanks Juli. She really tries very hard. I do some other, less extreme, balance and rear leg awareness exercises with her. This one I try not to do too often. She is a very fast growing puppy, so I’m a bit careful with her. Super cute puppy! She looks great! I have duration challenges with my 3 year old BC…she quickly offers another behavior. But I also realized that they dances around a lot while trying to maintain position (ie: in the box). With other tricks I taught her, like standing on the BOSU, she eventually figured out that rewards happen for staying in position until released. Often times I HAVE to toss a treat to get her off of it now. Same with Da Vinci and Cash. Releasing/ rewarding with a tossed treat like Silvia said really helps us…they can’t wait to get back on the object. I know! I have hard time keeping up with all of you too! 🙂 You’re FAST. This is our 2nd session on 4 paws in a box and 1st session with paw touch on bowl. Nova doesn’t really offer behaviours on her own so I do prompt her sometimes so that she doesn’t sit there looking at me blankly. Oh yes…I also can’t get Nova to have both her paws on the bowl. She just touches it and wait for my click. Any suggestions? When I first started clicker with her (at almost a year old), we did lots of simple boring behaviours. Sessions of shaping just a paw touch, just a nose touch, etc with different objects. It feels like it takes forever but we were good to go in less than a week. I wanted to teach the pivot box and could not get 2 paws on the book, so what a training friend advised me was to click and reward for 2 paws on other objects first -- a stair, pavement, her bed etc. It was easy to get the behaviour offered after that! The shaping got a LOT easier as she built up a bigger repertoire. Now when presented an object she will try those that she knows first -- a paw, a nose, stepping up, even retrieving it. Then click for approximations and go from there.. I was told the easiest way to get good is to pick a behaviour and just shape it step-by-step. We don’t use any cues until the behaviour is perfect because we want the cue to be associated only with the right behaviour.. Its more handler skill than dog skill! Our first behaviour was a retrieve (she would NOT retrieve before) and then packing up her toys in a basket..
As many people have said, if you don’t want her to give up, you need to keep the rate of reinforcement high.. So break up the criteria into little bits and click for any progress.. She won’t get the end behaviour immediately and if she doesn’t get clicked much, it won’t be any fun for her! Some people are blessed with dogs who work for a LONG time, but if I don’t get clicking enough Summer gets bored and we have to end the session.. Make Nova feel smart! Oh yea, for starters a flat dish would be MUCH easier to get the behaviour because she is more likely to “accidentally” step on it..
Back when I first started clicker training I had a dog conditioned to wait to be told what to do. Those are harder to get new behavior from because they wait for direction. In the beginning I had to spend a lot of time just clicking random things before she learned she could actually do things herself to earn a reward. But since then I have clicker trained my dogs as puppies and they are eager to offer as many random behaviors as possible. If you want to go more towards shaping. I love to use the box as the first object to interact with. Click for anything and everything. Walking to it. Looking at it. Sniffing it. Anything. Eventually you can start to hold out for new behaviors if you get repetitions. And that is how I eventually got my puppy going into the box. But like I said, with a dog conditioned to wait for direction it was harder. And I had difficulty on the bowl thing too. I ended up luring my puppy into position for a while and slowly cut out the cues I was giving. He eventually got it on his own but it took a while because I was helping him instead of him learning on his own. Silvia even noted on my post that having had a shorter object like the dish would have been better than the bowl I used (which is like yours). So maybe a short dish? Exactly, it is much harder with dogs that are already trained, but by a different system. An object like a box usually gives them more ideas what they could do, that’s also why we’re starting this class with tricks that include objects. Some dogs find it weird to step on something like a dish or a plate -- something like a towel or even their blanket might make it easier to start and then it’s pretty easy to transfer it to different objects. Transferring that paw touch to different objects is actually something I would recommend to everybody, it teaches the dog to generalize. If you need some ideas what to use, see Carla’s Brittany. Here’s an idea for getting Nova to have both her paws instead of just one on the bowl. If you used a taller object like something about one foot high, and you where standing up instead of sitting. Then Nova would put both paws on the object to get closer to you. Then work back to a small object. I tried to get Dragon to put 4 feet in a bowl rather than in the box we’ve been working with. I warmed him up with the box, then put the bowl into the box, and he put 2 in very quickly but didn’t think to put his hind feet in. Maybe after a break and some latent learning he’ll get it. With Summer before going on to the smaller box from the big box, what I did was put some other objects in to make the “standing space” smaller, so its sort of like weaning slowly rather than a sudden change in size. Also you could re-shape from the 2 paws in, it should go much faster.. But i think if the size change is gradual and he understands the criteria, you shouldn’t have a problem! There was no size difference — the edges of the bowl were immediately inside the edges of the box. He didn’t think to offer putting his back feet in at all… I think I need to shape him to get into other non-box but still large objects, where his back feet will go inside almost incidentally. Right now he probably only associates pulling his back feet inside with boxes. No problem, I hope it goes well! Yeah, a very big bowl would be great to make him see it’s just another shape of a box 🙂 In general, try to use as many different objects for the same trick as possible -- you can do the same with paw touches, 4 feet in etc. That will help him learn to generalize from one object to another more easily. I saw that you did that in your video, Cheryl. Good idea!